So everyone was impressed with how tasty this recipe ended up being. Often when you put meat and sauce together in a crock, the meat doesn’t hold onto the salt, pepper and spices that you put onto it, leaving one to have to re add the spices back on after. No one had to re add for this recipe, the pork held to the flavor perfectly and with the rice and sauce it was delicious. You could also make this pork chop recipe with a rice pilaf, mashed potatoes or egg noodles instead of rice. I used a liner and sprayed it with Pam. In a shallow pan mix the Pepper, Sea Salt, Oregano, and Paprika (or choose other spices that you enjoy more). Rub the spices into the pork chop, making sure it's not on too heavy. Place the pork chops down at the bottom of the Crock-Pot. Next pour the chopped onions on top of the pork chops in a layer. In a separate bowl mix the cream of soups, celery and garlic. Pour over the onions in a layer. If cooking on High, I would add another onion, placing a chopped onion first, and then the pork chops to keep them from burning, then back to the other layers (High would be 4 hours). Right before the Crock is ready, cook your rice (or mashed potatoes or egg noodles). Serve with the pork chop and sauce over the rice. Feel free to use whatever spices you like best with pork chops as your rub. I just choose what I knew my family would love. This will work great on rice, rice pilaf, mashed potatoes and egg noodles. Please remember the times are approximate. Some Crocks run hotter then others, so get to know your crock and go from there. If you use bone-in pork chops, expect that you will need to use the longer cooking times to get the meat cooked thoroughly. So glad to see this recipe! It looks super yummy. We are snowed in with expected temps of -25 to -30 over the next couple of days and the oven went out. I’ll be using this tomorrow! Thank you so much! I have made this for years. I use one of those crock pot lining bags….when I remember….they are fantastic. Do you add water or milk to either of the soups? No, you do not need to add water or milk. I made this last night and it is yummy. I don’t. I just use it as it is. Mine came out tender and juicy..not over dry. I did have to stack a couple on top of each other…i put onions between them but not the sauce. I have edited the recipe to include the can sizes which is 10.5 oz. And according to Google that equals 310.522 ml. I hope that helps. A crock-pot liner is a special plastic bag that you place inside your crock-pot and cook inside the bag. It is just a convenience and helps with clean up. You just remove the liner when you are done cooking and throw it in the trash. It is not needed for any of our recipes just an extra. I loved this recipe! Thank you fir sharing. This was enjoyed by the whole family including my 7 year old daughter. I made this last night. The spices on the pork chops really worked well!! I put this over noodles as we -always- do rice. Family loved it and it was one of the easier preps I’ve had. I don’t have cream of celery. Would a can of cream of chicken work? You can…but cream of celery has a different taste then cream of chicken. I am sure it would turn out good, but not the same. I just love all your recipes! Do you have any for pork steaks? Or can I use the same recipes you have for pork chops? We buy our pork at a butcher and get a lot of pork steaks with the chops so would like some ways to cook them as well in the crockpot…thank you!! Do you think frozen pork chops will work in the crockpot for this recipe? It will take longer, and it may be hard to keep the sauce staying on without it not thawing it a little bit at first. Hi Chris! 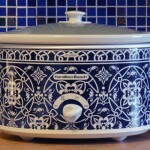 Welcome to the wide world of Crock-Pot cooking! This recipe for Crock-Pot Pork Chops was cooked in a 6 quart slow cooker (I have updated the recipe to add that information). Because this recipe is for 6-8 pork chops you could easily adjust it down to 4 pork chops in your 4 quart slow cooker. Just adjust all the ingredients a little bit down and the cooking time would be reduced by 1 hour. If you try it, come on back and let us know how it turned out for you! This is a pretty forgiving recipe!